Vickie asked for an update. My darling girl is wearing a huge space boot right now. Huge as in it makes her foot look like she is wearing a size 18 shoe (Shaq-attack). She is allowed to put 50% of her weight on her leg so she can use it to stand and maneuver single, short steps with a no-wheel walker but she is not walking on it - yet. She uses her knee walker to get around from place the place in the house and outside. In two weeks she is having surgery to remove the bottom two screws. The other seven will remain a part of her. A few days after surgery she will be starting physical therapy. Once she can climb multiple staircases and walk without additional support she will return to New York City. She hopes to be back to her apartment and commuting to work by her birthday in early May. The bone position is good. 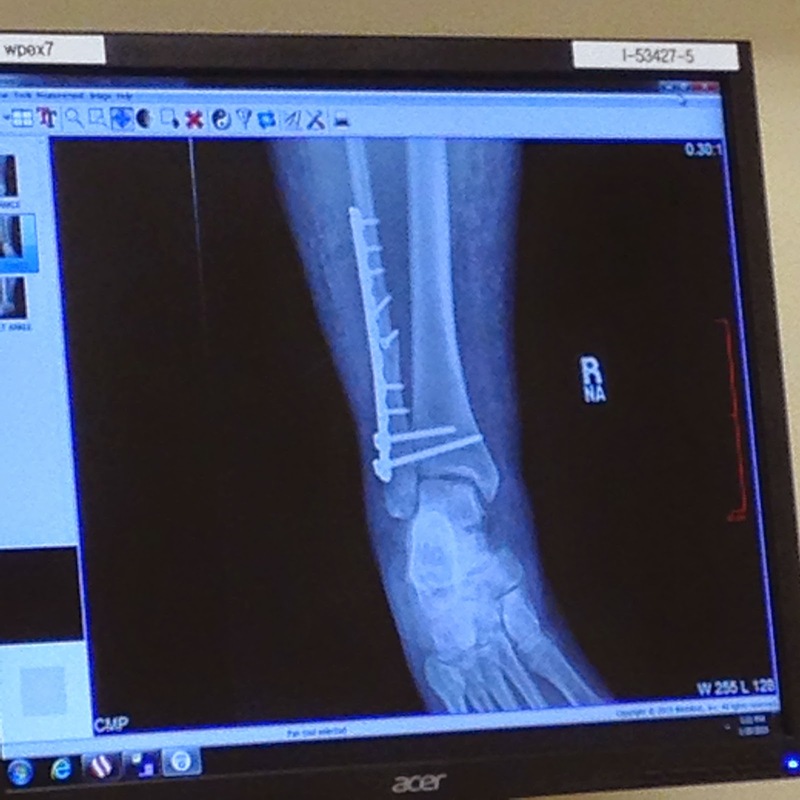 and the bones appear to be healing well. Time and effort will tell more. You can feel the heads of the bottom two screws through her skin. It is kind of weird to feel hardware inside her leg. Goodness sakes (bottom 2 screws)! Glad things are going smoothly (from the sounds of it). We are realizing how very lucky she is compared to some other cases. Someone she knows has a friend who broke his leg at home, in his kitchen, slipping on a spill. He is still not walking after 9 MONTHS because of infections and twice rejection of the screws. Vickie: What happened with your daughter? My son wrecked his knee playing football. He will need a knee walker for a while. Is insurance typically willing to cover the cost of the knee walker? All I know is that my daughter's surgery expenses are killing us, so I am trying to cut as many corners as possible. Insurance did not cover the knee walker but she could submit it to her job for reimbursement with her flex spend account. That was good. She had it five weeks. It was wonderful for her here in Orlando. If she had been in her own home in NYC it would have been useless.